Happy New Year, everyone! I never did get back to the blog over the holidays to write a proper greeting. On the radio this morning, the DJ's were saying that it's now officially too late to wish someone a happy new year, so I figured I'd better jump online and squeeze it in ASAP! The dressier pictures are from a wedding we attended the weekend before Christmas. The kids' babysitter got married and asked my son to be the ring bearer! See the lollipop above? It was the bribe that got him to actually walk down the aisle. It was a fun night and the kids had a blast, especially once the music started and the dance floor opened up. It was fun to see a wedding through their eyes. They thought the bride looked like a princess! 2010 is already off to a great start, sewing-wise. Lots of cool new things to talk about! First, round 8 of the Doll Quilt Swap has opened up over on Flickr. I had promised myself that I was going to sit this round out because I had fallen a bit behind in my block swaps before the holidays and it really stressed me out, but if you're a regular reader of my blog, you know how this story ends. Yes, I couldn't resist. I waited and waited and finally sent my info in -- I think I was one of the last 20 people admitted into the swap! I just couldn't help it. I really believe this is the gold standard of mini quilt swaps -- gobs of talented quilters continue to participate, and I'm excited to join in again. At least this time I refrained from being one of the swap moderators. That should help! Some pretty cool stuff, huh? 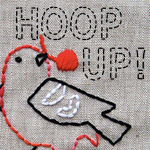 I've also started a new swap over on Flickr called the Hoop Up! Stitch & Send Swap. In this swap, each swapper is assigned to a group of 6 or 7 people and hand embroiders a small design for every member of the group. These designs are based on a theme selected by the recipient, and the completed pieces can be used in a quilt, a wall hanging, pillows, a table runner, or any number of cool items! I love everything in this mosaic! 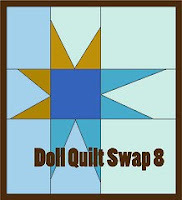 Finally, I want to put a call out to all of my fellow quilters in the Raleigh-Durham area. There are some people mobilizing to start a local branch of the Modern Quilt Guild for the Triangle area. If you're nearby and interested, check out this discussion thread on Flickr, or just leave me a comment (or shoot me an email) and I'll get you all of the pertinent details! I just spent about half an hour going through the Flickr mosaic you put together and everything is so gorgeous! Can't wait to see what you come up with for your partners and what they come up with for you! Happy New Year to you and yours too John! Hey John! I live in N. Durham, and while most of my projects aren't necessarily modern, I'd love to learn more about how to get the modern look from some folks in the area. Thanks for blogging about the opportunity! I am amazed at what beautiful work you do! You have a lovely family and your children are precious! I have followed your blog for the past year and I love to see what all you do. 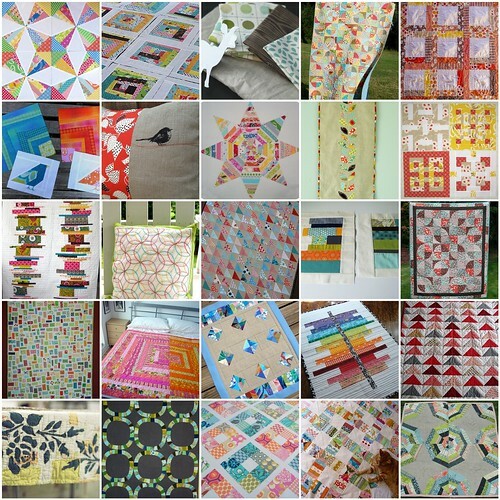 I love to quilt, but have been on a sabbatical from quilting for awhile. I need to get motivated and get back to my sewing. My stash is out of hand. Love & blessings from NC! Hi John - cute photos of the kids. Okay it's forecasted to be 58 here next weekend, so I can get through this weekend knowing that. I would love finding more about a modern quilt guild close by. Absolutely gorgeous designs. And, I would definitely be interested in a Modern Quilt Guild. Lastly...did you see my finished bag with the catfish embroidery? And the post after that one shows what I made with those panels. todo muy bonito como siempre John !! felicidades por tus trabajos !! 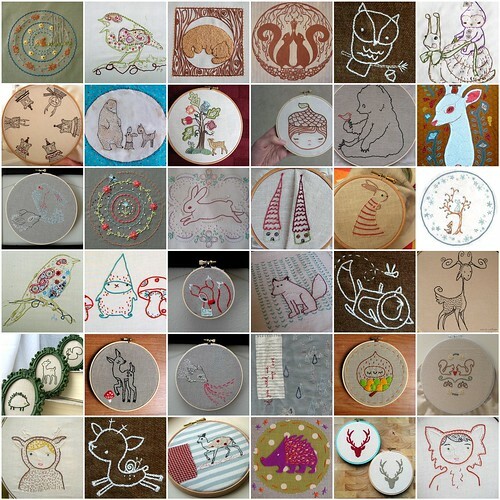 Two of my doodle stitches are in your mosaic. I'm flattered. Sounds interesting. What exactly is the definition of "modern" in this instance? happy new year back at ya! 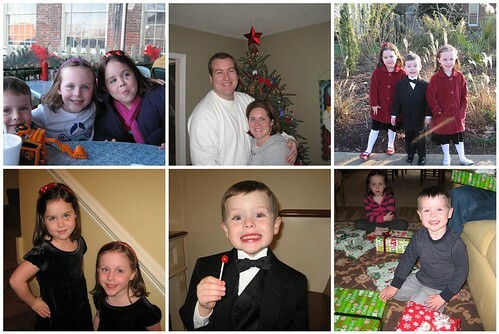 the kids look adorable all dressed up...looks like you had a great time at the wedding! wonderful wishes to you and your family for 2010!!! What a lovely family you have! I like your picks in the mosaics. Hey, did you get my fish fabric from Spoonflower? I'd love to see if you make anything out of it. I'd be honored, actually.